the saw blades are very sharp. I use the magic saw for stuff like doing minor fixing around the house. My husband said blades are sharp! What's the most he likes this small saw its made of a real steel, and he also likes when his having trouble cutting some part of his project that its hard to reach. He's tickled to have this small saw. I would like to buy it which is your weigh in kg? Just to have around the house for small repairs. Hope it helps me with sawing some branches and also sizing down shades that have very thick round "cardboard" rollers in them. I like that it has blades for different uses. Looks good to do small household jobs. I am always needing something small and easy to handle to cut things, and this seems like it will fit my needs. Single woman. Need various tools in my home. I plan to use this for small projects . It's good for all materials. Mom is always cutting down a tree. She gets into other mischief too. I need a saw for small crafts and this looked like it might hold up to sawing wood but is not too big. By the way, your shipping is too high when a person only wants one item. If my purchase were $3.00, the shipping would be more than the item. AT TIMES I COME ACROSS HARD TO CUT MATERIAL AND FEEL THAT THIS SAW WOULD BE MORE PRODUCTIVE IN CUTTING CERTAIN MATERIALS THAT A NORMAL SAW BLADE COULD NOT CUT. NEED THIS FOR IN THE HOUSE, NEVER KNOW WHEN YOU MAY NEED ONE. I'm a DIYer. Hoping this works as well as people say. SEVERAL PROJECTS IN MIND WHERE THIS SAW WILL COME IN HANDY. can i get two of the 6.9 L flat to replace the one i have worn out? The others are good. Magic Saw blade for wood is what I am asking about. I have been using mine to trim my oaks, and every other tree I have. BEST ANSWER: Thank you for your question. Unfortunately, we do not carry the replacement blades for the Magic Saw, we only carry the Magic Saw. We hope this information will be of help to you. need to find the directions for this? BEST ANSWER: Thank you for your question. Please watch your email we have sent you an email with the instructions attached. We hope this information will be of help to you. I need to cut glass bottles, can this saw do that? BEST ANSWER: Sorry ~ have not needed to use it yet. Will this saw through a geode? It has gone through steel fence, aluminium chain link fence, marble counter top and of course wood. Learned the hard way that the blade must be tighten even during use and to work gently and let the blade to the work or the super fragile blade will break. Love this saw purchased two extras just for the blades. No !!! Geodes are quartz which cannot be cut with a steel saw. Also it isn't big enough. You need a diamond impregnated round saw blade run by an electric motor and a vise to hold the geode steady. It also needs a water spray on the work area to protect the blade. 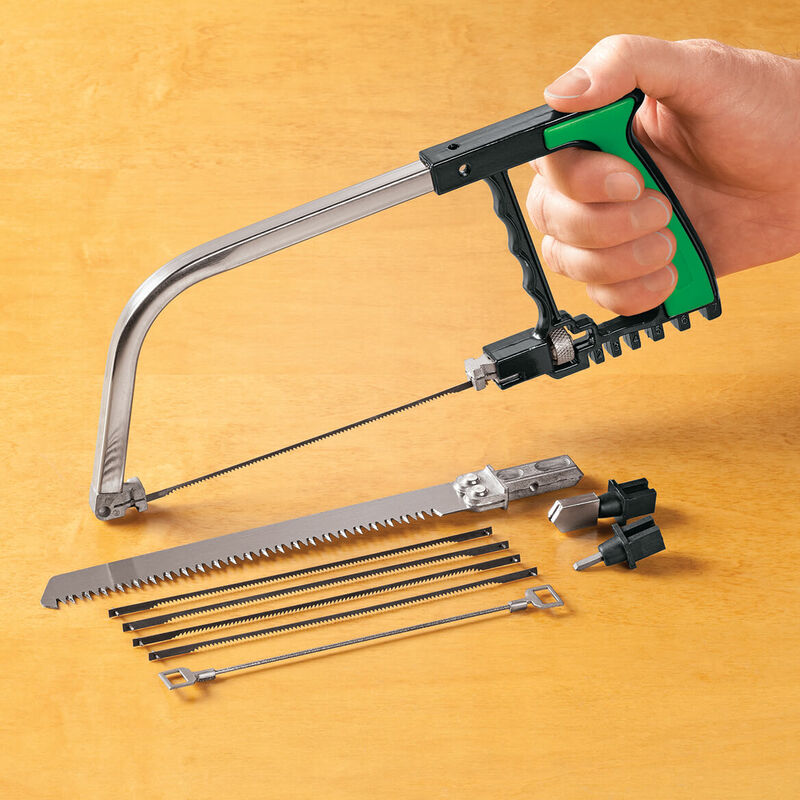 Where can I find instructions for magic saw? Looking for the directions also? There are no directions !!! All of the blades provided fit the handle, additional blades can be purchased at your local hardware store. No directions come with the saw. All included blades fit the frame. Additional blades can be purchased at your local hardware store. Where can the complete directions be found? what are the two items with chisel points used for? There appear to be two diamond blades; one round, one flat. What are their uses? BEST ANSWER: Thank you for your question. You should receive your order in 4-8 business days. We hope this information will be of help to you. BEST ANSWER: Thank you for your question. Please check your email we have sent the instructions for the saw. We hope this information will be of help to you. What is the l x w x d of this item when 6.9" blade attached? BEST ANSWER: Thank you for your question. 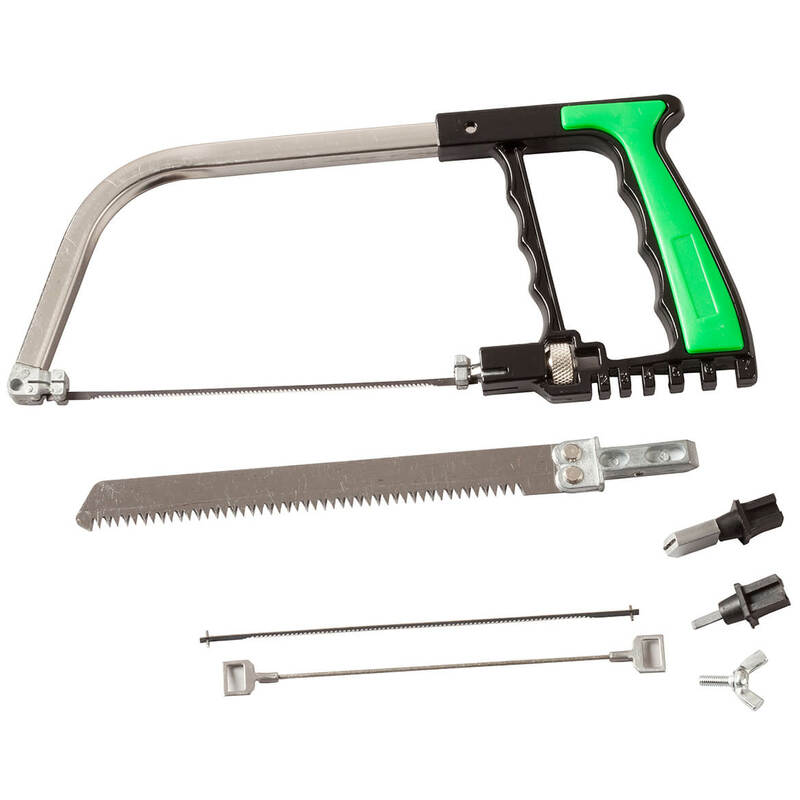 The saw with the handle is 10 3/4" long the handle is 4 1/2" high and about 3/4" wide. We hope this information will be of help to you.